It's holiday time y'all! I'm from Milwaukee, which means I grew up surrounded with German traditions. One of my favorites is the story of St. Nick. On the eve of December 5th, all the children put up their stockings (the original tradition was shoes) and St. Nick comes and fills them with candy and little trinkets. As I aged, once I knew that Santa wasn't real (!!!!) my mom still held on to the St. Nick tradition for me. Instead of candy and Beanie Babies, I got my yearly Christmas ornament. It was always something that reflected back on the previous year and showcased my accomplishments or talents. I went through a serious Tinker Bell phase, so for almost a decade every ornament was Tinker Bell. Two years ago, I got a camera ornament. I've got a couple of flutes to remind me of my 9 years as a concert flutist, and Cinderella's castle the year I went to Disney World - on a band trip. It's one of those holiday traditions that has always meant a lot to me, and I wanted to hold on to it for my children. Fast forward to this year, and now I'm living in the South, where no one has ever heard of St. Nick. I've got three kids in the house now, and traditions to make with my husband. But I just cannot let St. Nick, or the yearly ornaments, die. 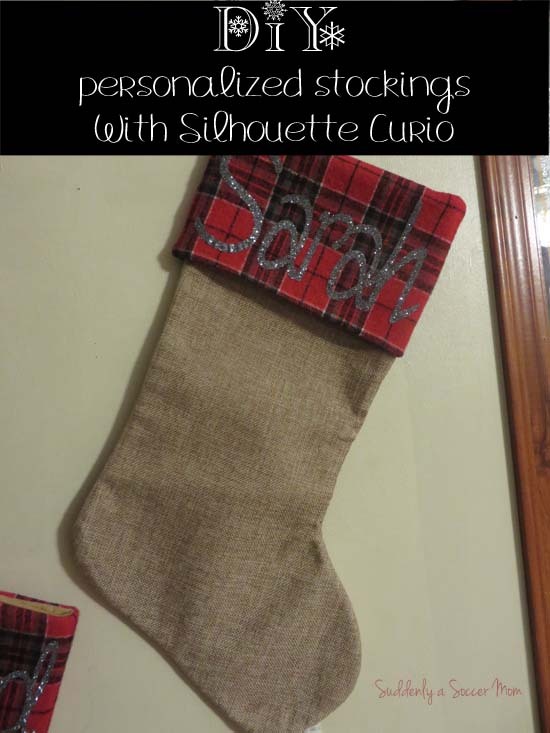 When Deputy Dad and I went back to Wisconsin for our honeymoon, my mom bought our entire family some red plaid and burlap stockings from Stein's. Is this another Midwestern thing? I love Stein's. I loved the stockings, but wanted to personalize them a little bit for each member of my home. Enter my beloved Silhouette Curio and some silver glitter heat transfer vinyl. I started out by measuring the plaid section of the stockings where I wanted everyone's name to go, and they measured out at about 5" wide and 8" high. This works out perfect, because the cutting size on the standard base for the Curio is 8.5" x 6". Then I wrote out the name I needed, and used the font Dear Joe 5 from dafont.com. 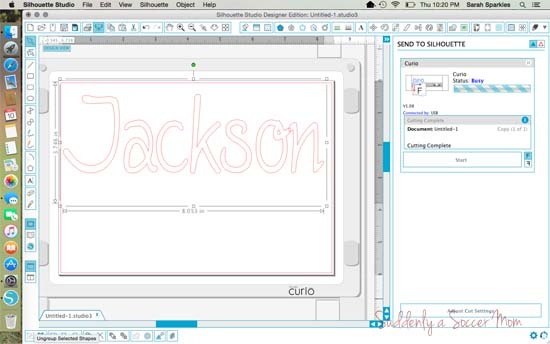 Once you have the name typed out like shown above, select the text and click "Ungroup Selected Shapes" in the lower left hand corner of Silhouette Studio. Once you have the letters ungrouped, slide each letter so that is touching. 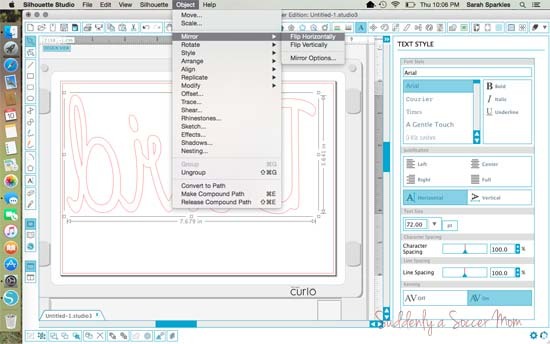 Once the letters you would like to touch are, you know, touching, go to the Menu, then go Modify >> Weld. This will connect the letters at the places that are touching so they cut as one piece. I did this because I wanted it to look like handwriting on the stockings, and the way I write I connect a lot of my letters together. If you don't like this look, you can skip all of this. 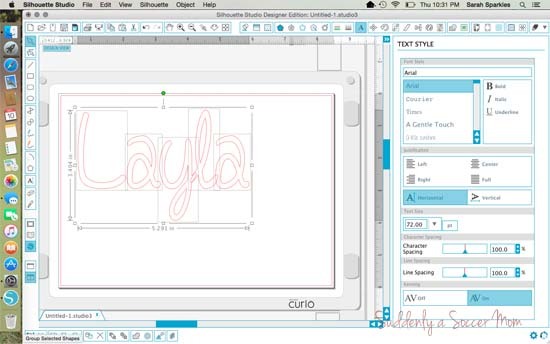 The part of this that you absolutely cannot skip when using heat transfer vinyl is mirroring your object to cut. 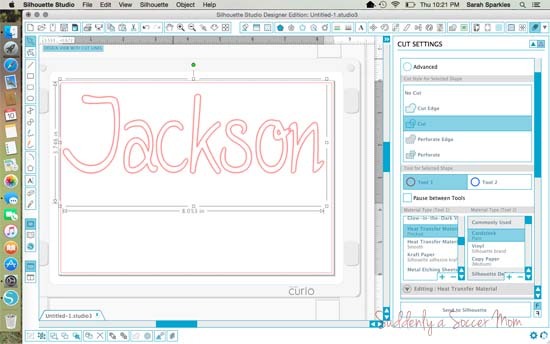 To do this, make sure your text is selected and go back up to the top menu and select Object >> Flip Horizontal. Once you've done this, you're ready to cut! 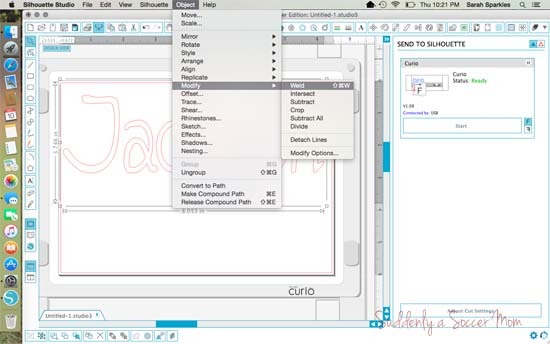 Once you hit the Send to Silhouette button, you have the ability to adjust the cut settings. Make sure that you select the material you're cutting. In this case, because I used the glitter HTV, I selected the Flocked option, because the glitter is textured and not smooth. I set my blade to the recommended depth and used stacked my platforms to have a thickness of 5. When you're using HTV, always place the glossy side down in your cutting machine. Once everything was cut and weeded, I applied the design right side up to the plaid part of my stockings and put a towel on top of the plastic part of the HTV. Then I used my preheated iron (no steam!) and my minimal upper body strength and pressed down on the design for about 1 minute. After removing the iron and the towel, I was then able to peel off the glossy plastic and had pretty sparkly names left behind. The best part? No Elmer's glue or loose glitter to make a major mess all over my house. For this year, the stockings are hung on the living room wall outside of our master bedroom. They're just stuck to the wall with some small Command Hooks that I picked up from Amazon (Prime shipping is life!) Next year I'm hoping that I'll be able to find a cuter way to hang them, but for this year I'm just thrilled I was able to keep my stocking tradition alive. Each Kidlet also got their own ornament...but they'll be getting them on Christmas Eve instead of St. Nick. Their stockings will also be important clues to their Christmas gifts this year. Rather than putting gift tags on their presents, each Kidlet has his or her own special wrapping paper. Scraps of this paper will be hidden in their stockings, and they have to match the scrap to their wrapped gifts. This way we get to store our gifts under the tree (except for Santa's, of course) and we don't have to worry out The Big reading tags and knowing whose gifts are whose. So how about you? Are you with me in the St. Nick tradition? What fun holiday traditions does your family have?